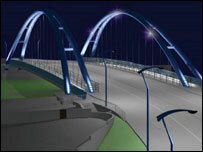 A convoy of 60 trucks will be arriving in Blackburn, carrying the steel needed to build a new £9m bridge. The Freckleton Street Bridge is part of a major revamp of the Lancashire town which will also see a new dual carriageway being constructed. Motorists are urged to be patient as the HGVs deliver the steel to the services near junction 4 of the M65. The trucks will stay there until they are escorted to the Freckleton Street site as they are needed. Traffic will also be disrupted on the A666 over the next few days. The new dual carriageway, which councillors say will reduce the amount of time it takes to travel around the town, is due to be finished next year. It will link Barbara Castle Way to Bolton Road via the bridge, completing the town centre orbital route.